Immunogen: Recombinant protein corresponding to full length human CASP3. 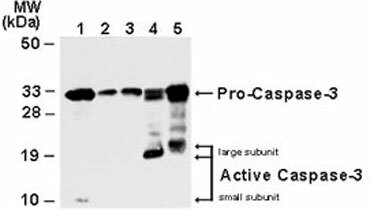 Application image note: Western blot analysis of CASP3. Lysates from Jurkat cells (lane 1) , normal mammary tissue (lane 2) and surgical specimens from three invasive ductal carcinomas (lanes 3-5) were normalized for total protein content (50 ug/lane) and western blotted with CASP3 polyclonal antibody (Cat # PAB0242) . 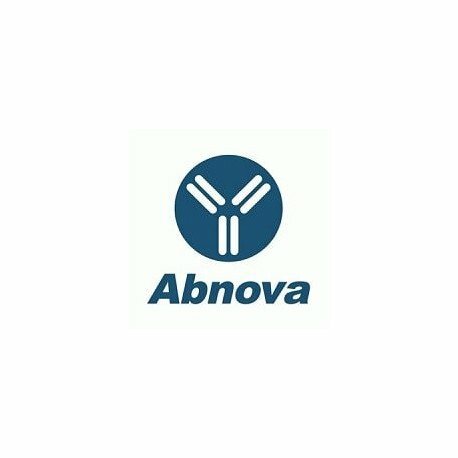 The ~32 kDa pro-CASP3 protein was detected in all samples. Active/cleaved CASP3 was identified in Jurkat (10 kDa small subunit, lane 1) and two ductal carcinomas (14-21 kDa large subunit) .